so we'd better cover ALL bases! and urge them ALL to VOTE NO on HB 1684. Their contact info is at the bottom of this alert. (in case you missed this updated email Tuesday evening). HB 1684 has already passed the House (see vote), and is currently on the full Senate floor TODAY (Tuesday, April 2, 2019) at 1:00 pm. ACTION ITEM: Shown at the bottom of this article are the names and contact info for all of the Senators. BE SURE TO CONTACT THEM and let them know you do NOT want HB1684 to be passed. Urge them to VOTE NO on it. The problem here is an open borders policy, folks! Open borders are a potential threat because of violent gangs, drugs, weapons, diseases, radical practices and religions, as well as being expensive to the American taxpayer, etc. Why shouldn't we consider our National Security, as well as the impact on our society and our economy? What about in-state tuition for all U.S. citizens out of state, if they qualify? Secure Arkansas is weary of unequal practices of ignoring the needs of our students. This bad bill attracts more illegal aliens into our state. If this bill passes the Senate, this policy would wrongly reward illegal aliens who entered the country illegally and will boost student enrollment. We should be concerned that the bill would draw large numbers of illegal aliens to the state and will become a financial burden to taxpayers. This law would take college seats away from U.S. citizens and make the state a magnet for more illegal aliens... and the policy would violate the 1996 federal law limiting benefits for illegal aliens who came here illegally. "Of the projected 50.7 million public school students entering prekindergarten through grade 12 in fall 2018, White students will account for 24.1 million. The remaining 26.6 million will be composed of 7.8 million Black students, 14.0 million Hispanic students, 2.6 million Asian students, 0.2 million Pacific Islander students, 0.5 million American Indian/Alaska Native students, and 1.6 million students of Two or more races. The percentage of students enrolled in public schools who are White is projected to continue to decline through at least fall 2027 along with the percentage of students who are Black, while the percentage of students who are Hispanic Asian, and of Two or more races are projected to increase (source)." "Current expenditures for public elementary and secondary schools are projected to be $654 billion for the 2018–19 school year. The current expenditure per student is projected to be $12,910 for the 2018–19 school year (source)." Note: 12,000 to 15,000 Marshall islanders are living around the Springdale area, and Tyson employs many of them. In the 1940s, the U.S. Military tested 67 nuclear bombs in the islands. (We're thinking these islanders should NOT be included in this illegal immigration issue!) They were relocated to this area because of the devastation of the bombing. They now have their own clinic, and operating costs are shouldered by the state (taxpayers). Here is the contact information for the Senators for this legislative session. Urge them to VOTE NO on HB 1684. Here is the contact information for the Representatives for this legislative session. Urge them to VOTE NO on HB 1684. Last edited by ALIPAC; 04-03-2019 at 11:22 AM. They have NO Student Visa to attend any of our schools. No more two sets of rules for those who come legally on a Student Visa and those WHO jump the line and criminally trespass across our border! Get them out of our schools and no in-state tuition! 1. HB 1684 replaces American students in the limited seats in our colleges with illegal immigrants. 2. More than 30 states have rejected similar in-state tuition for illegals bills since 2004. 3. A JWP Civitias poll found that 81% of southern voters were less likely to vote for any lawmaker who supported in-state tuition for illegals. 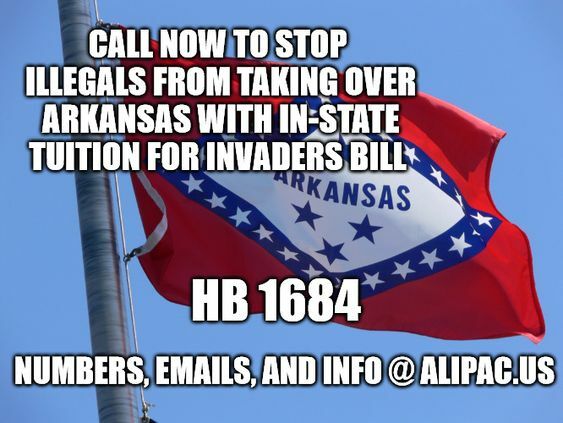 Please tell the special interest groups asking you to vote for HB 1684 that you represent American citizens, not foreign nationals and illegal immigrants and that you stand with the 81% of your voters that oppose HB 1684. Last edited by ALIPAC; 04-03-2019 at 12:50 PM. Call now (vote today) to stop in-state tuition for illegals in Tennessee! TODAY STOP in-state tuition to illegal aliens!!! El Pueblo to Push In-State Tuition for Illegals in NC Today!